Sample categories to the left, scroll down for more. I wrote a comprehensive post on the clip club blog about what was covered in this session and even though it only lasted about 45 minutes we seemed to cover a lot of ground. The animation: The Big Match (by Northern Irish animators: Nathan Mateer, Kris Kelly, Aodhan O’Braoin, Gus Hughes and Paulina Brinck) has made a big impression and the kids will be making their own digital memory. Dw – normally quite reticent, is animated in his response to the film. In terms of team playing he is introverted, a seeming day dreamer, who when called upon articulates a vivid imagination. Seeing him engaged in focussed individual study and making connections between different elements in the clip is a joy. He also recorded his own story on his phone during the week. A couple of the lads still find it difficult to focus and seem to need constant reinforcement when ‘let loose’. The focus that most enjoyed whilst working on their own with an iPad and headphones in different parts of the library, is indicative of a pleasing sense of control – pausing and playing the clip over and over to write notes on what they see and hear. Digital media are conducive to self-directed iterative play, mobility and going at your own pace. I’d like them to get used to this way of working so that it becomes habitual practice. 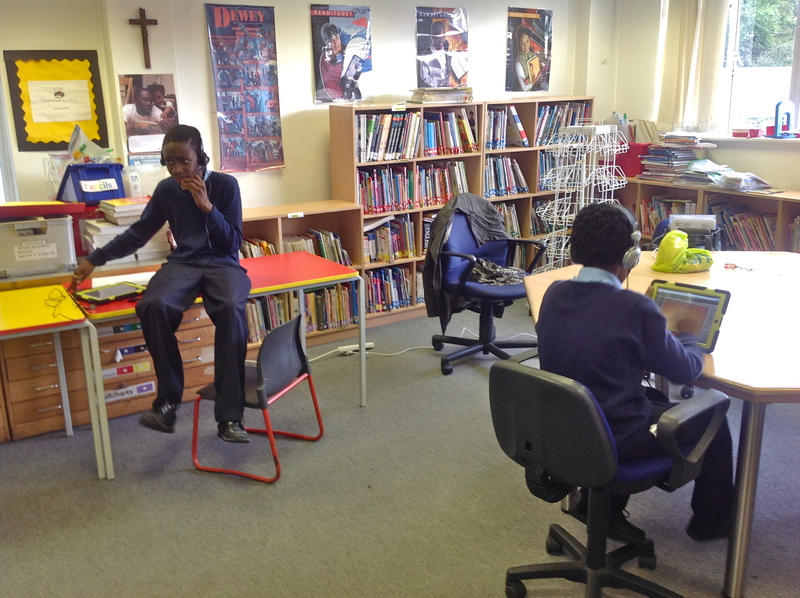 It is so often the case that students engaged in individual study are marshalled into quiet watchable rows. Roving learning is to be encouraged, where possible. The independent learning in evidence here reminds me of the same ambience created during observations of Chris Waugh English class some months ago where the students were editing footage from a sports person’s visit (forget who) – making documentaries in iMovie, working in groups. Chris’s classroom at the time was in the basement and enjoyed some evocative Victorian features. These nooks, crannies, stairwells and staircases are all spaces that mobilise learning.